Your car gets towed, and who do you blame? Yourself? God no, you blame that impossibly confusing parking sign. It’s a fair accusation, really. Of all the questionable communication tools our cities use, parking signs are easily among the worst offenders. There are arrows pointing every which way, ambiguous meter instructions and permit requirements. 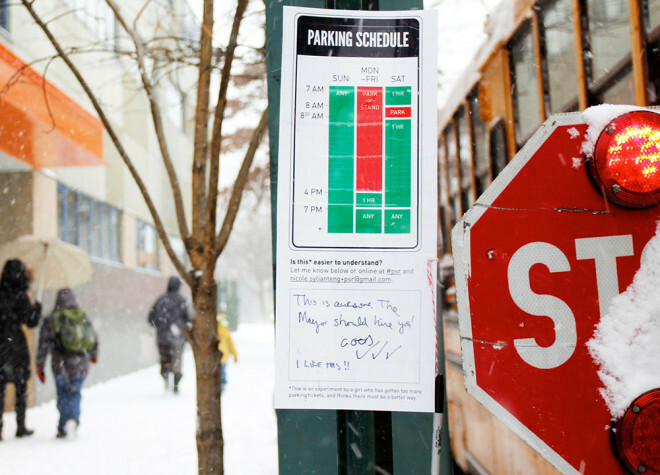 A sign will tell you that you can park until 8 am, then right below it another reading you’ll be towed. It’s easy to imagine that beyond basic tests for legibility, most of these signs have never been vetted by actual drivers. 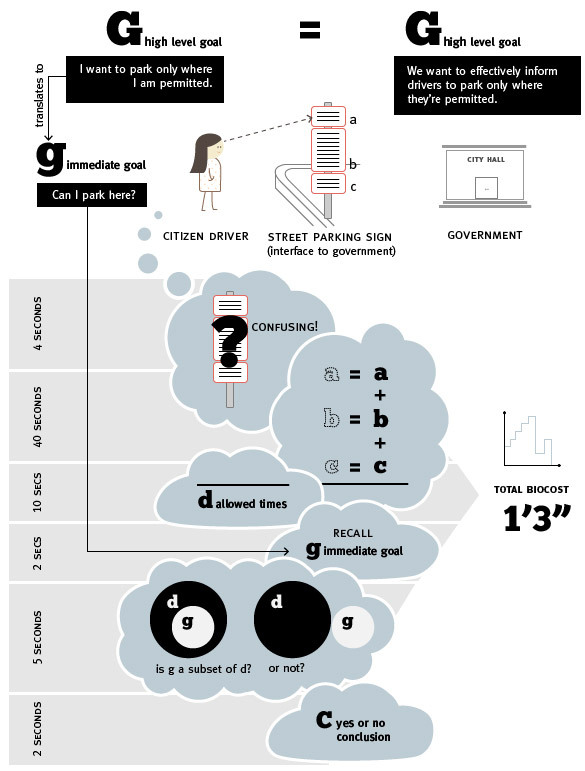 I’ve gotten one-too-many parking tickets because I’ve misinterpreted street parking signs. The current design also poses a driving hazard as it requires drivers to slow down while trying to follow the logic of what the sign is really saying. It shouldn’t have to be this complicated. 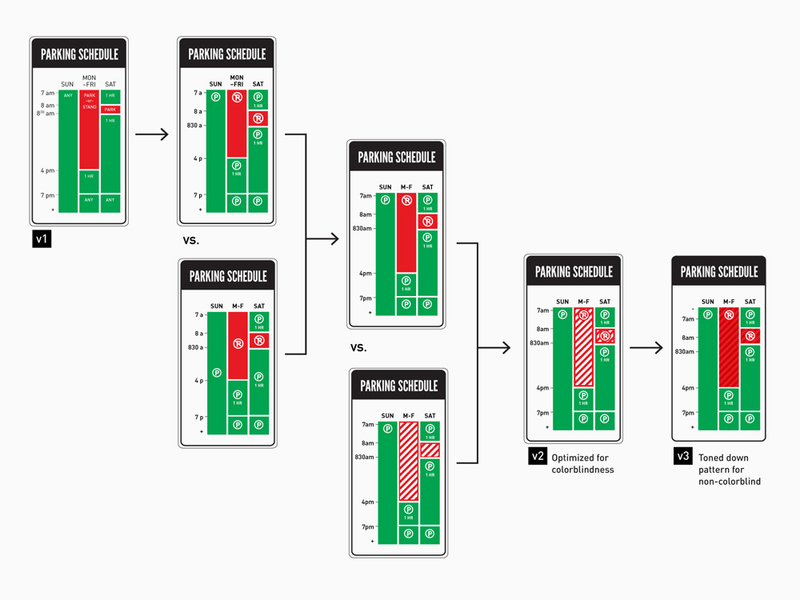 My strategy was to visualize the blocks of time when parking is allowed and not allowed. I kept everything else the same – the colors and the form factor – as my intention with this redesign is to show how big a difference a thoughtful, though conservative and low budget, approach can make in terms of time and stress saved for the driver. I tried to stay mindful of the constraints that a large organization like the Department of Transportation must face for a seemingly small change such as this. 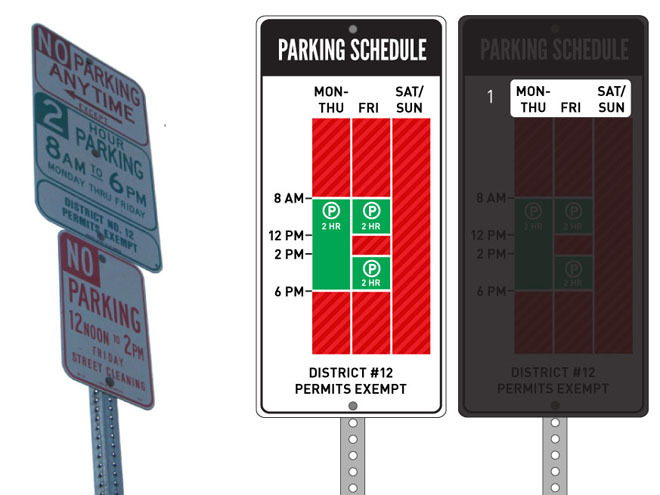 Liz Stinson, A Redesigned Parking Sign So Simple That You’ll Never Get Towed, Wired, July 15, 2014, http://www.wired.com/2014/07/a-redesigned-parking-sign-so-simple-youll-never-get-towed-again.